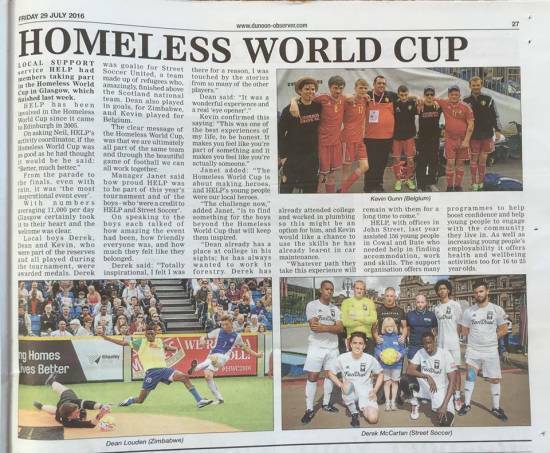 We can all be proud of the fantastic job that Scotland has done in playing host to the Homeless World Cup 2016, the week-long International 4-a-side football tournament which was held on George Square from the 10th to the 16th of July. However everyone here at HELP Ltd would like to further express how proud we are of Dunoon’s very own Derek McCartan, Kevin Gunn and Dean Louden who all competed in the life changing tournament. As the host nation Scotland were required to provide eight reserve players for the tournament, essentially for cases in which countries cannot afford to bring substitutes, or for players who are forced to withdraw with injury. This opened up a fantastic opportunity for our three boys from HELP who became fully involved in the tournament with Kevin Gunn playing for Belgium, Dean Louden playing for Zimbabwe, and Derek McCartan playing for the newly formed Street Soccer United who replaced the absent Canadians. The Homeless World Cup is all about making a positive change through football and changing people’s lives. With the number of spectators averaging 11,000 per day, the impact that this experience has had Dunoon’s local boys has been incredible. On speaking to the boys each spoke of how amazing the event had been, how friendly everyone was, and how much they felt like they belonged. Derek Said: “It was totally inspirational, I felt I was there for a reason, and I was touched by so many of the stories from other players”. Dean Said: “It was a wonderful experience and a real eye opener”, and likewise Kevin expressed how “this was one of the best experiences of my life. It makes you feel like you’re part of something and it really makes you’re actually someone”. Manager Janet added: “The Homeless World Cup is about making heroes, and HELP’s young people were our local heroes”. “The challenge now is to find something for the boys beyond the Homeless World Cup that will keep them inspired”. For HELP’s Activity, Health and Wellbeing Coordinator Neil Kelly, it was amazing to witness the boys reflecting so thoughtfully and positively on the experience using words such as “inspirational” and “life changing”. Moving forward the boys have plenty to be excited about as they work with Neil to organise and take responsibility for hosting a local football tournament in Dunoon, before trialling for the Scotland squad to compete in Belfast in the Homeless Home Nations tournament in September.